This event had a simpler schedule than last spring, with all the talks located in the main auditorium. This had the advantage of the attendees more easily hearing all the speakers. The vendor areas opened early each morning and remained open throughout the event, except for the bee bowl, but I will go over the vendor and product highlights in another blog. Morning Day 1: Paul Newbold, NCSBA President announced upcoming events to start the day. Quickly approaching events include testing on April 27 at both Newbern and Morganton. Then the summer convention in Hickory, NC August 8, 9, and 10. The EAS will be holding its summer convention in nearby Greenville, SC in June. This is a 22 state organization, and so having the event this close is special. Well, it has been 21 days since we last checked our hives. Since it is mid-winter 2019 and a nice day, we decided to weigh them today, January 28. We started in the home yard and found five with nearly ten pounds of weight loss so far this winter. The others either lost six pounds or less or even gained (probably from robbing other hives and/or drifting). A few hives were defensive on one stand, so we used smoke to weigh them. We are continuing to monitor our hives this winter. We started winter with 31hives and when we went and inspected all the hives on January 7th and 8th; we found that one hive had absconded. There was a small patch of capped brood, and they still had about 9 lbs. of sugar in the top of the hive. There was no sign of moisture and only two dead bees on the bottom board. There were wax cappings on the hive floor, signs that the hive had been robbed, but probably after they absconded. The insulation on the front of the hive was damaged, so we believe that a varmint harassed the hive enough that they left. Our hives continued to use supplies very slowly, another three weeks and we were down an average of less than two pounds. For the period Nov 17 through January 7, our hives have used an average of 3.5 pounds of stores. I am convinced that changing bee breeds and insulating the hives is paying off. Late Winter 2018 We survived the hurricane season with no damage, and heading into winter we focused on accomplishing several tasks. First and foremost, we fed and fed our hives to get the hive weights up for winter. Also, we also made some other changes to help with winter survival. 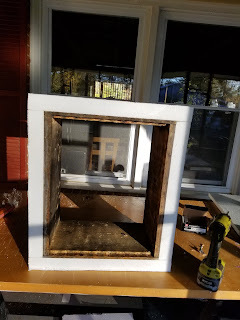 Changes to How We Winter Bees Insulated Hives One issue that hurt the bees last year was food and specifically food not being where the bees could access it late in the year. When we inspected hives, some were out of food, but more had food at the edges and couldn’t get to it during the last cold spell. Late summer has been busy for beekeeping in the Piedmont.It seems that the frequent rains this summer have helped with forage for the bees better than the past few years. So feeding our bees this summer has kept the hive quite full of bees, pollen, and food stores. Because we started feeding too late in the dearth last summer, this summer we fed our bees earlier and in greater quantity.So we have been inspecting them every ten days to 2 weeks this summer. This is working well except for the toll the heat and humidity have taken on us. It seems that most of the hives are becoming quite used to inspections and they go quickly. Also, we have been able to do better at keeping propolis build up to a minimum at the top of the hives. The canvas covers we use when we are not bucket feeding are working so well. The bees hardly notice when we open the hives. Welcome to my blog. I will be writing about the next year in my beekeeping journey. It is possible that the blog may continue on, we will see. You may be wondering about why I am starting the blog now, instead of the spring when the bee season begins in earnest. It is because now is the time when we have to make the preparations for the winter. We are in a nectar dearth, the bees are getting frustrated and the decisions we make will shape the future of our apiaries.